If you notice, there is now a little "Play" button in between the arrows to advance my slides at the bottom of my Google Presentation. I purposefully set the slideshow to advance every 3 seconds while it plays. Click on the "Play" button and try it out for yourself. Another great use for this feature is if you are interested in doing a live Pecha Kucha style presentation. If you set your slideshow to advance to the next slide every 20 seconds, then it will force you to create a Pecha Kucha style presentation. Therefore, keeping it short, sweet, and to the point! 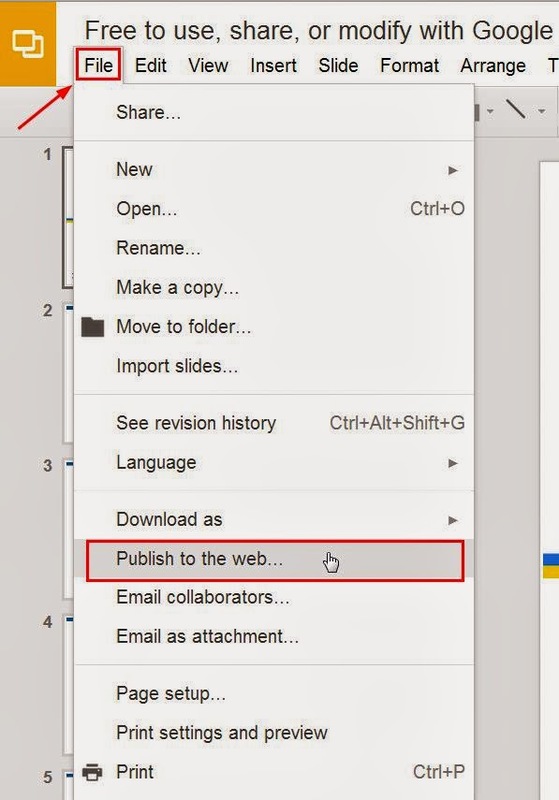 The next time you create a Google Presentation, consider publishing it to the web so that you can embed your slideshow, and customize its playing settings. 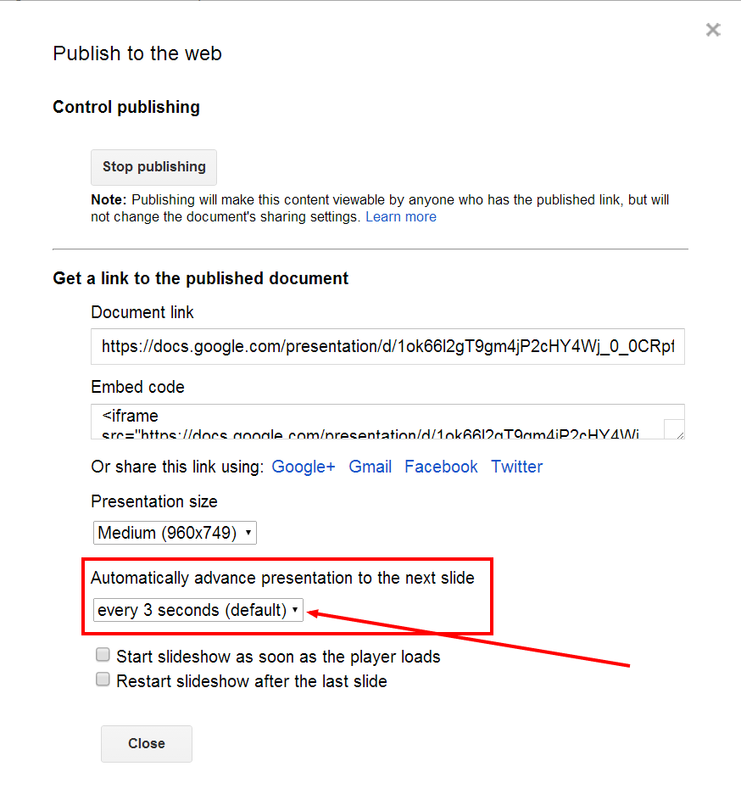 What might be some other advantages to setting your Google Presentation to "Autoplay"? Have you figured out how to advance slides every 20 seconds without embedding the presentation, since that is not one of the options when publishing? I ended up setting each slide for 10 seconds, but making a duplicate of each slide, so it would play for 20 seconds. I want my slide show to auto present every 5 seconds and also have youtube videos autoplay during auto presentation, but it keeps transitioning to the next slide before the youtube video is done. Is there a way for it to wait for the video to end before transitioning again? Hi Josh, that is a great question that I honestly do not know the answer to. I have done some research and have not found a solution to your request. I'm not sure if this is a feature that Slides offers yet. I am trying the same thing with having students drop videos from Google drive into a group slide show where each video will autoplay one after the other. They are all 2 min and the slide advances at 1 min. I need 2 minutes not 1 minute. any ideas? Yes! :) Just set the autoplay to 1 min., and then duplicate each slide you want playing for 2 minutes. Have a great day! Is there a way to do the same on a iPad? And if I need a slideshow to show for 20 minutes? I would like to display a 20 minute countdown timer with group information for my students. Any ideas there? My slide advances before the the video finishes. Is there a way to fix that? Hi Julie - Unfortunately I do not know if there is a way to fix that. There might be a workaround, but if there is, I am not aware of it. Videos in autoplay slides might not work well. Thanks for writing! Thanks for the helpful post. Have you run into setting a presentation as a continuous loop and yet it eventually stops looping? We have videos embedded like some other commenters, but they seem to be working fine. It's just that eventually when the presentation ends, it doesn't restart for some reason. Any thoughts?